Three third-year students from the School of Agricultural, Earth and Environmental Sciences (SAEES) took part in the inaugural edition of the Old Mutual Agricultural Student of the Year Competition and made it to the final round. The competition was organised by Old Mutual and Plaas Media to identify top agricultural students at South African universities. The students were selected from a pool of nine UKZN students during the KwaZulu-Natal round of the competition and presented in one of three categories beef production, sustainable agriculture and land expropriation without compensation (EWC). Mr Keshveer Singh of Animal Science addressed beef production, while Ms Jessica Lubisi of Soil Science presented on sustainable agriculture and Mr Lungani Mvelase of Agricultural Economics investigated EWC. The three finalists received prize money from Old Mutual. 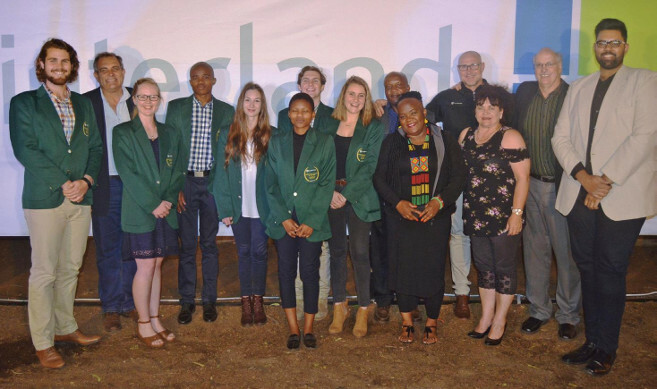 They travelled to the final round of the competition at the Alfa Expo in Parys, accompanied by Professor Pardon Muchaonyerwa, and competed against finalists from the University of Pretoria, the University of the Free State and Stellenbosch University. At the event, they had the opportunity to interact with the broader agricultural industry. Lubisi said she felt privileged to have been part of the initiative. ‘It has taught me various ways in which we can be sustainable in agriculture and has opened my eyes to the real world in the working sector of the industry and unleashed a new world of possibilities. Mvelase said the experience was enjoyable and that he looked forward to seeing the competition process being refined in future editions, to allow it to be opened up to more participants. ‘I thank UKZN for allowing us to participate; it was a great experience for me,’ he said. Organisers of the competition highlighted the value of participation for a student’s experience, setting them apart as they enter the industry. Old Mutual visited UKZN after the competition to acknowledge all nine UKZN students who took part in the first leg of the competition. ‘If you take this [experience] as a seed and plant it, it will produce something,’ said Professor Albert Modi, Deputy Vice-Chancellor and Head of the College of Agriculture, Engineering and Science (CAES). He thanked Old Mutual for their investment into students, and acknowledged UKZN colleagues for their efforts in assisting with organising UKZN’s participation, and thanked students for seizing the opportunity to take part. ‘Projects like this are part of our way of giving back and adding value to communities that we work with,’ said Old Mutual Marketing Manager Ms Charmain Shandu, who shared some of Old Mutual’s vision and impact. ‘In a few years’ time you are going to make such an impact in South Africa and the world,’ said Shandu, who applauded the students for their bravery in stepping up to the competition.